There have been rumours swirling for a while now that Taylor Swift will be releasing new music this year. This is based in part on Perez Hilton claiming that Taylor confirmed she'd be releasing a new album before her 30th birthday in December, her reference to being "excited about the next chapter" during her AMAs acceptance speech last October, and some mysterious date stamps on her 2019 calendar. And if there's one thing we know about Taylor, it's that her attention to detail is second-to-none. In fact, virtually everything she does has some hidden meaning and nothing is accidental. Take the video for "Look What You Made Me Do," for example, which contained no less than 45 hidden messages. Well, because new music seems imminent, fans are speculating that some of the clothes she's worn over recent months are actually very clever hints at the possible theme of TS7. The theorising began with the costume party that Taylor threw for some of her showbiz pals on New Year's Eve. The theme was "childhood heroes," and she dressed as Ariel from The Little Mermaid. But then fans began to notice that mermaids have popped up several times over the past year. 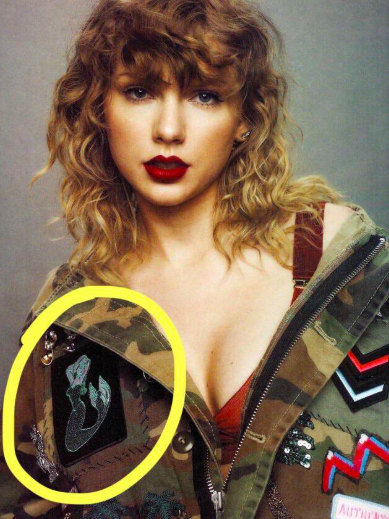 For example, she wore this jacket with a mermaid motif in the magazine which was released alongside physical copies of Reputation back in November 2017. 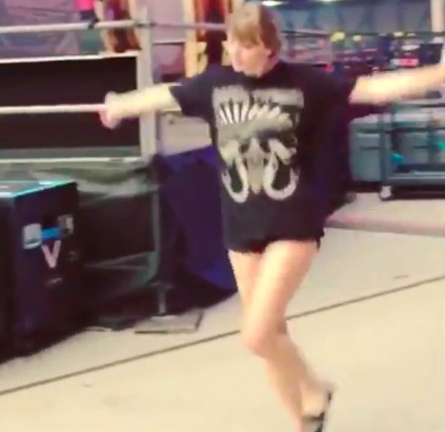 And, at the end of her Reputation tour documentary which was released on New Year's Eve, Taylor can be seen in the blooper reel wearing a T-shirt emblazoned with two mermaids. In fact, it's actually the very last shot in the entire movie — i.e. the last appearance of Taylor in the Reputation era. So, of course, theories have sprouted. Some people think that her new album will have a mermaid or fantasy theme. IS !!! TAYLOR?!! ALREADY??? GIVING US ??!!! TS7 CLUES?!! OMFG THE MERMAIDS IS TS7 THEME IM-???? Others have noted that Ariel "transforms" at the end of The Little Mermaid, and so perhaps Taylor will transform with the release of her new album. Some have investigated the symbolism of mermaids and found some pretty interesting results — namely that they're heavily associated with love. And, given that Reputation was an album filled with love songs and her relationship is still going strong, it stands to reason that TS7 will follow a similar theme. While others think the album will actually have a broader nautical theme thanks to Taylor's love of the sea. And let's not forget that she's used water imagery in previous songs, including "This Love," and "Clean." One person suggested that rather than an album, the appearance of mermaids point to a song offering a modern twist on The Little Mermaid, in the way that "Love Story" was a re-telling of Romeo and Juliet. And it might be a bit of a reach, but back in May last year fans went wild over the fact that Taylor had the word "Eternal" hidden in her dress at the Billboard Music Awards. Many fans speculated back then that "Eternal" was the name of an upcoming song or album. And there is a link between this and mermaids — mainly that they traditionally embody eternal youth and beauty. However, a couple of people have taken the theory even further, speculating that perhaps Taylor will play the role of Ariel in a live-action version of The Little Mermaid. Oh god. What if this means... Taylor is playing Ariel in the new disney adaption? Zendaya is also rumored to be getting the role... This would be a tough role for Taylor as it is rumored that a POC will be Ariel so if Zendaya isn't chosen then she'll most likely face backlash. But some people are pointing out that fans have been very wrong when it comes to guessing the name and concept for Taylor's albums in the past. For example, fans were convinced that 1989 would be called "Roses" and Reputation would be called "Time" thanks to similar "hints" she dropped prior to their releases. 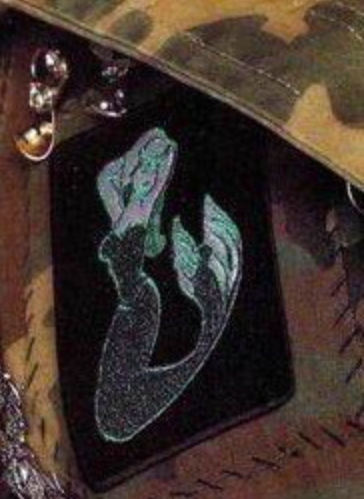 So, time will tell as to whether this whole mermaid thing is a reference to her new music, a simple coincidence or an artful troll from Taylor.